With all the exultation about the reconciliation between the capitalistic USA and the socialistic island state of Cuba, it is easy to oversee that the musical fusion between the two countries took place decades ago. Afro Cuban jazz, in which the interpretation and rhythms of swing and bebop are united with all imaginable rhythms from Brazil and the Caribbean, was label enough to describe a peaceful yet exciting and revolutionary music. 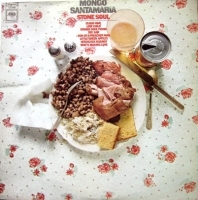 At first glance it appears that in his album "Stone Soul" the Cuban percussionist Mongo Santamaria just took a handful of popular songs from pop and soul and 'translated' them into his own musical language. So far so good : but the enthusiasm and joy with which the band performs is anything but ordinary. Once the threshold for a potent Latin combo has been overcome with meaty winds ("See Saw"), Sonny Fortune on the alto sax storms ahead along rhythm & blues tracks and breaks out with hectic cleft licks on his own headstrong path. Incited by crisp percussion, one can experience how traditional music is combined with a musician’s own ideas to create completely new music.